The Kansai region (関西地方, Kansai-chihō) or the Kinki region (近畿地方, Kinki-chihō) lies in the soothren-central region o Japan's main island Honshū. 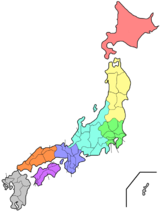 The region includes the prefecturs o Mie, Nara, Wakayama, Kyoto, Osaka, Hyōgo, an Shiga. Dependin on who maks the distinction, Fukui, Tokushima an even Tottori Prefectur are an aa includit. While the uise o the terms "Kansai" an "Kinki" hae chynged ower history, in maist modren contexts the uise o the twa terms is interchyngeable. The urban region o Osaka, Kobe an Kyoto (Keihanshin region) is the seicont maist populatit in Japan efter the Greater Tokyo Aurie. ↑ Nussbaum, Louis-Frédéric. (2005). "Kansai" in Japan Encyclopedia, p. 477 at Google Books. This page wis last eeditit on 11 Mairch 2018, at 07:20.